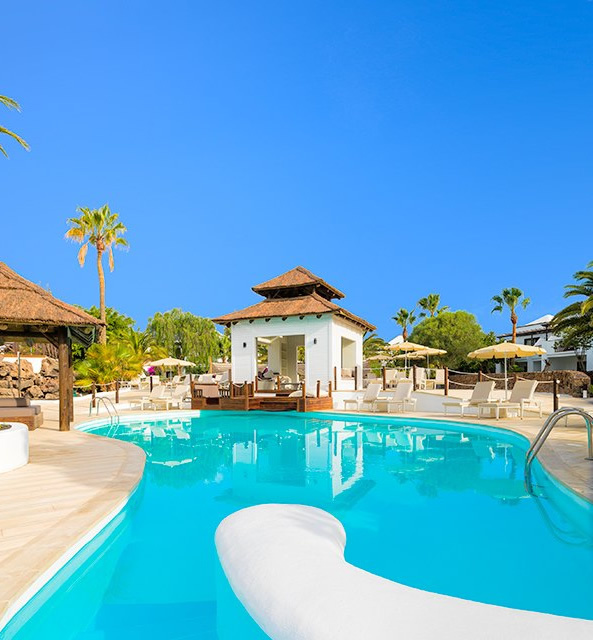 The award winning adults only (including a Certificate of Excellence from Trip Advisor 2014) H10 Sentido White Suites has an ideal location close to the beach in a quiet area of Playa Blanca Lanzarote. Recently refurbished this boutique hotel provides guests with an elegant yet contemporary interior design that embraces traditional Canarian architecture all complimented by lovely gardens and a sparkling swimming pool, the 3 Star Sentido H10 White Suites provides great facilities with adults in mind and an excellent base for those wanting everything nearby including; shops, restaurants, bars and water-sports. Arrecife International Airport is only 33 km from the hotel. The White Suites feature 200 Suites including executive suites with either land or sea views for up to a maximum of 3 persons. 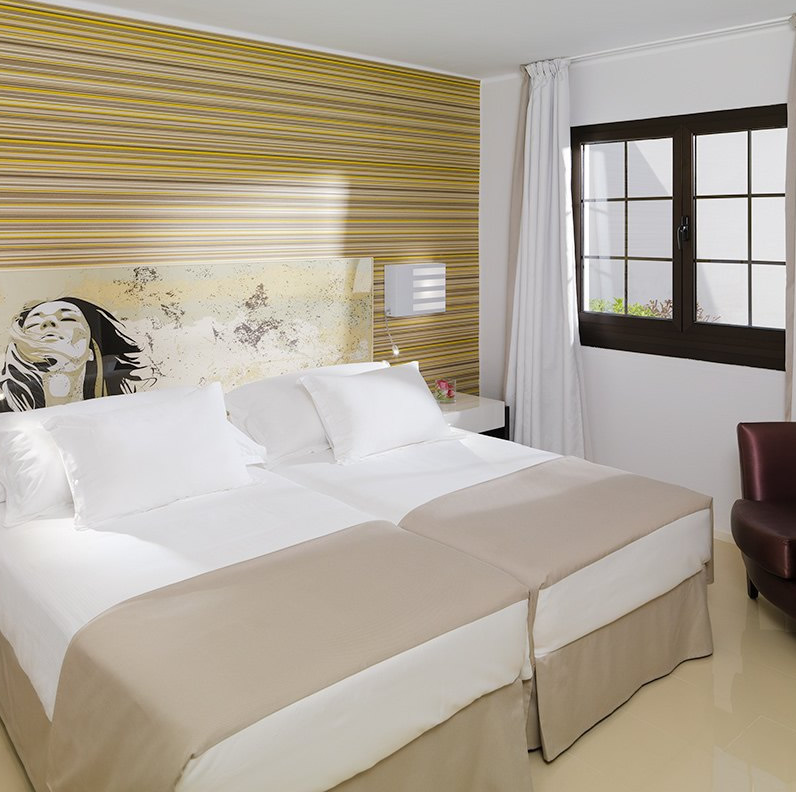 The Suites are fitted with a bedroom, separate lounge and balcony or terrace. All Suites have a fully equipped bathroom, air-conditioning, dressing gown, pillow top and slippers, Flat screen TV with international channels and USB port in the bedroom and in the lounge, iPod and iPhone docking station, safe (extra charge), minibar, restocked daily (charged according to consumption), A Nespresso coffee machine (4 courtesy cartridges per day, extra cartridges have an additional charge), and 1 courtesy bottle of mineral water per person on arrival. The main meas are served in the Bamboo Restaurant*: a buffet style restaurant with 'show cooking' and a pleasant outdoor terrace. During lunch, the Bamboo Restaurant offers main à la carte dishes in addition to the buffet's range of international dishes. Also available is the La Choza Bar *: a poolside bar offering a snacks menu and evening entertainment. The lobby bar Sirocco Bar: is open in the evenings with live music (at least 2 nights a week). Closed in summer. 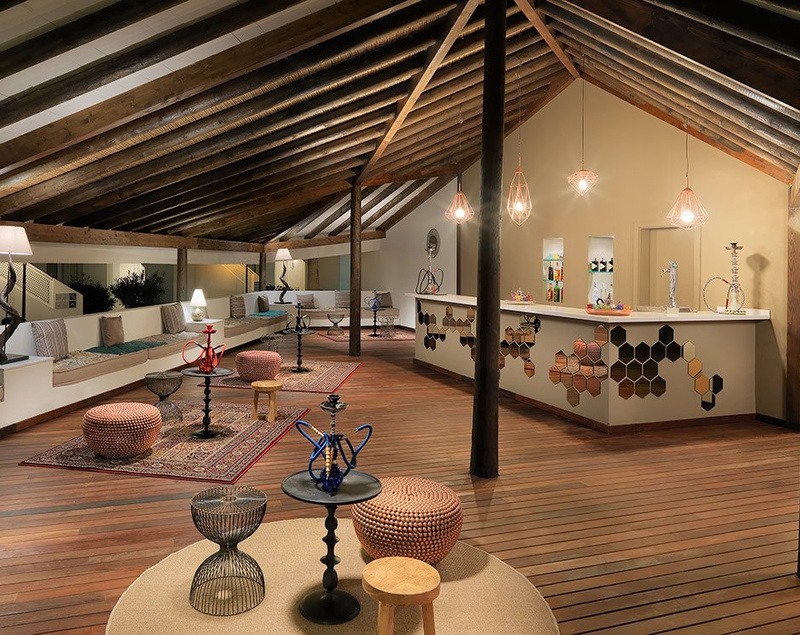 A great place to chill out is the bar La Haima: located next to the pool it offers a select menu of teas, shishas (traditional Middle Eastern water pipes) and cocktails. *Offers the option of meals tailored to diabetics and coeliacs (on request). All Inclusive Service: Breakfast, lunch and dinner, as well as à la carte snacks for the late breakfast and afternoon refreshment services. A Broad selection of national drinks is available with this option. Guests can enjoy two swimming pools (one heated in winter). The hotel provides a full programme of sports and activities organised by the entertainment team, the Blue Team, activities are designed especially for adults and focused on well-being and the appreciation of gastronomy. 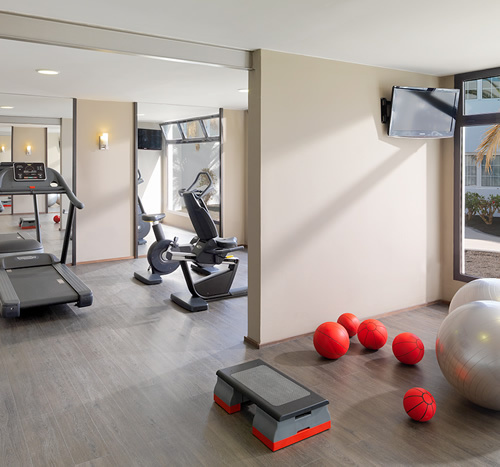 Daytime activities include: Zumba, Yoga, Pilates, Stretching, aqua aerobics, water polo, Sjoelen, darts, boules, table tennis, archery and rifle shooting. Evening activities programme: themed nights in the Bamboo Restaurant (a least 2 dinners per week), professional shows and live music. 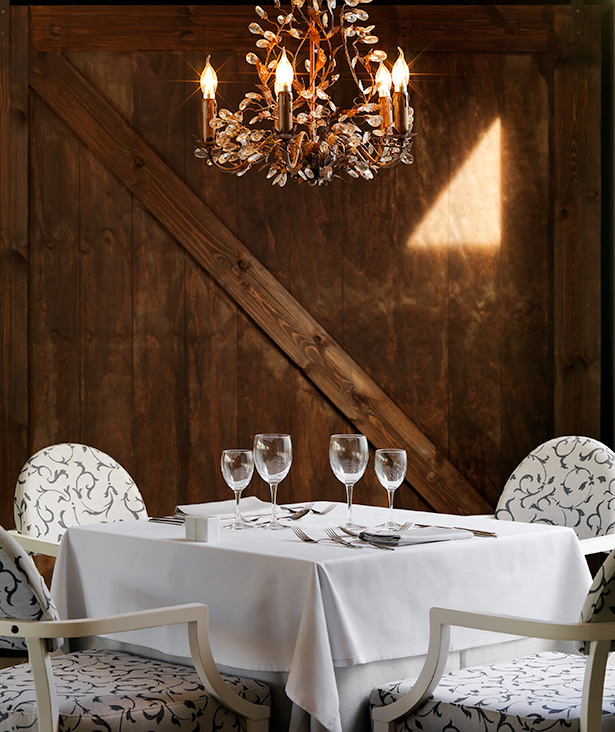 Guests can also enjoy wine tasting or participate in several gastronomic activities. Take some time to relax in the new Despacio Beauty Centre, a Health and Beauty Centre where you can unwind and be pampered with personalised treatments during your stay. There are multilingual staff available at the 24 hour reception. Free WiFi is available throughout the hotel, there is computer access in the internet Corner (with additional charge). Indoor parking with surveillance (with additional charge). 24-hour medical service (with additional charge)There is a Supermarket just next to the hotel.